I personally get on well with gluten, a natural protein found in wheat and other grains. I am, however, painfully aware that not everyone is as lucky. Gluten-free bread recipes don’t have a particularly good reputation; but I found a great recipe that uses a variety of gluten-free flours and tastes delicious! When preparing wheat dough, a stretchy web is formed. This elastic gluten network expands with the gases formed in the fermentation process, holds moisture and prevents bread from crumbling. 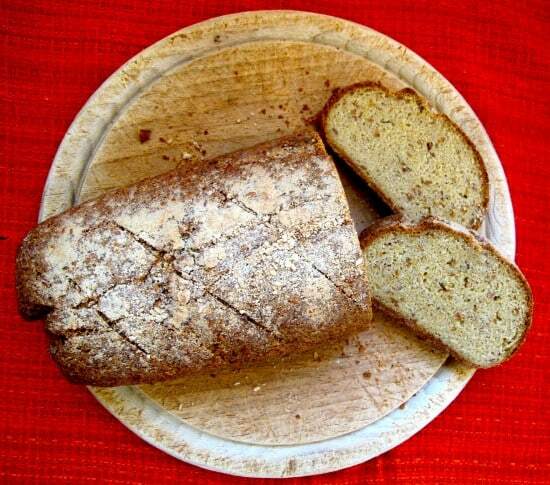 In gluten-free bread baking, ingredients such as linseed and psyllium husks help to hold the bread’s shape. Golden linseed, when toasted and added to the liquid ingredients of bread dough, releases a sticky gluten-like gum which softens the crumb. 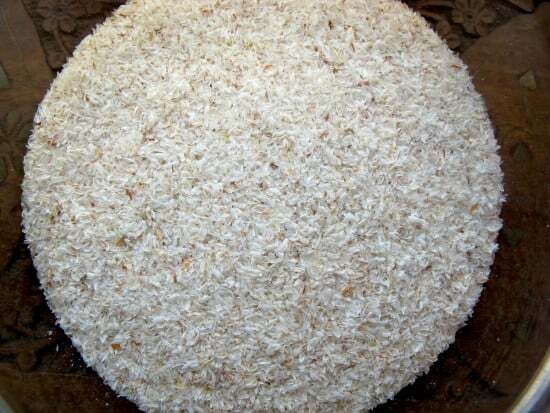 Psyllium seed husks, a source of fibre, bind moisture and make gluten-free breads less crumbly. Kneading is not required as gluten (the stretchy network) can’t be developed. The dough needs to be quite wet as gluten-free flours soak up much more water than wheat. Although gluten-free bread doesn’t keep too well and gets stale quickly, freezing parts of your freshly-baked loaf solves this problem. 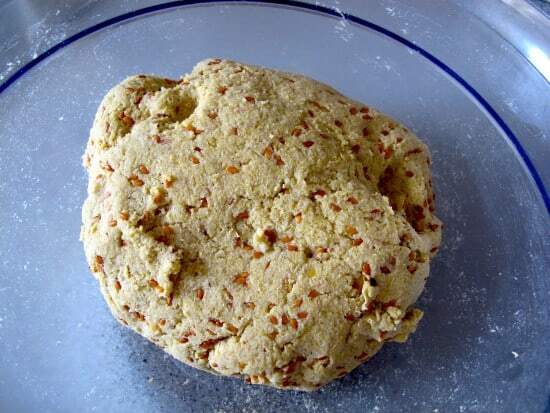 There is a good variety of alternative flours which can be used in gluten-free baking. Gluten-free flours can be made of corn, tapioca, buckwheat, rice, chickpeas, beans, soya, millet, potatoes, teff, chestnuts, almonds and peas. Health food stores and more and more supermarkets stock gluten-free flours. Real Foods stocks a great range of flours and ships worldwide. Gluten-free bread baking does not mean sourdough-free baking. Teff flour sourdough for example is usually used to prepare the Ethiopian bread injera. On this note, there are some very interesting findings in terms of making wheat sourdough bread safe for people with coeliac disease. More on this with some encouraging results on Celiac.com. I used a Dan Lepard recipe for this gluten-free buckwheat and linseed bread, substituting half of the cornflour with buckwheat flour. Cornflour is a useful base flour with good binding properties, however its nutritional value is limited. Buckwheat adds flavour and nutritional quality into the mix. I don’t have to opt for gluten-free breads, but I think this buckwheat, cornflour and linseed loaf tastes great and takes very little effort. It’s spongy and doesn’t break up or crumble although it’s a little cake-like in consistency. As I used half corn and half buckwheat flour, the bread has a strong buckwheat taste. This isn’t a bad thing at all if you like the distinct buckwheat flavour, like me. I personally like combining this bread with very salty flavours. It works well with smoked fish, gherkins and cottage cheese but I have also tried more Mediterranean-style toppings such as black olive pâté or a tomato, olive and basil salad with pecorino shavings.